Roberto Olivan's choreography gives life to '1971', Teatro del Temple's new production - R.O.P.A. 1971 is finally coming to the stages. This performance is the new production by Teatro del Temple with Roberto Olivan’s choreography and Carlos Martín’s artistic direction. The show will be premiering on 19th and 20th September at Teatro Principal de Zaragoza, within the artistic programming of Festival Internacional ZGZ Escena 2018 and it will be the second world premiere of the festival in this edition. 1971 is a dance-theatre-music performance that gives life to the album 1971 by Rafael Berrio, a Basque poet and singer-songwriter. 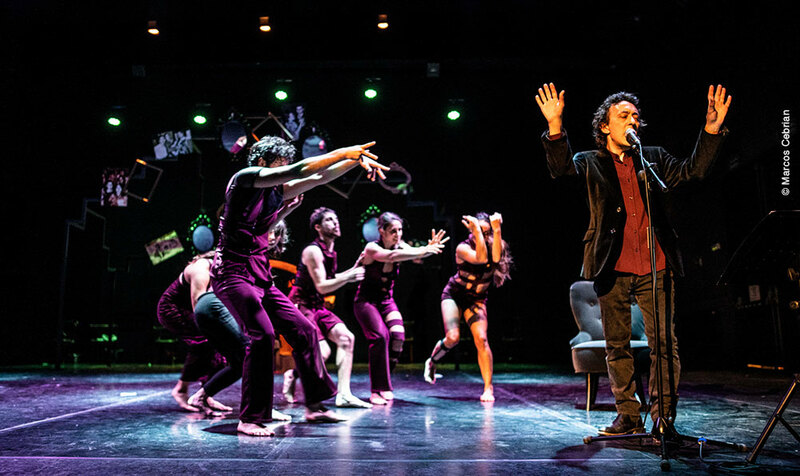 In the show, which lasts 75 minutes, Berrio himself performs his songs live while the six dancers (Magí Serra, Paula Romero, Miguel Ángel Fernández, Laura Alcalá, Isabel Abril and Agnès Balfegó) explore Rafael Berrio’s feelings, art and life and create an imaginary world full of poetic power, memories, emotions, irony and humour. In May, Teatro del Temple’s management team, Rafael Berrio and the cast were in residence at l’Obrador – Espai de Creació, which is the headquarters of the company R.O.P.A. – Roberto Olivan Performing Arts in Deltebre (Catalonia, Spain). 1971 is a co-production between Teatro del Temple and Zaragoza’s Patronato Municipal de las Artes Escénicas y de la Imagen (municipal board of performing arts). 1971 is part of an intense year of creation for Roberto Olivan, who this year has returned to the stage with his performance Cuculand Souvenir. This large-scale production combines dance, circus, music and visual arts to explore the impact of technological evolution in our daily life. The show was premiered at the festival Sismògraf in Olot (Catalonia, Spain) in May, and since then it has toured several stages around the country. Cuculand Souvenir will continue touring this year through Catalonia: Teatre Nacional de Catalunya in Barcelona,Teatre Auditori Felip Pedrell in Tortosa and Teatro Monumental in Mataró. The 2019 tour will include both national and international stages, like Staatstheater Darmstadt (Germany) and Kalamata International Dance Festival (Greece).